Daniel Clive Wheldon (22 June 1978 – 16 October 2011) was a British motor racing driver who won the 2005 IndyCar Series Drivers' Championship for Andretti Green Racing (AGR). He won the Indianapolis 500 in 2005 and 2011, and a was co-winner of the 2006 24 Hours of Daytona with Chip Ganassi Racing (CGR). Wheldon began competitive karting at the age of eight and achieved early success, before progressing to open-wheel car racing in the U.S. F2000 National Championship, the Toyota Atlantic Championship and Indy Lights. He began driving in IndyCar with Panther Racing in 2002. The following year, Wheldon moved to AGR, winning nine races (including the 2005 Indianapolis 500) and finishing as the runner-up in the 2004 series championship. He won the drivers' title in 2005 with the record for most victories during a season in his time with the team. In the 2006 season, he moved to CGR, tying Sam Hornish Jr. in points but finishing second because of count-back on the number of victories claimed by both drivers. During the 2007 and 2008 seasons, Wheldon's form lowered but he won four additional races and placed fourth in points in both years. He returned to Panther Racing for the 2009 and 2010 seasons, failing to win a race but taking a further four podium results during this period. Wheldon left the team at the conclusion of the season. He drove part-time for Bryan Herta Autosport and later Sam Schmidt Motorsports in the 2011 season. He won his second Indianapolis 500 in May of that year. At the season-ending IZOD IndyCar World Championship at Las Vegas Motor Speedway, Wheldon was killed in a collision with a fence post alongside the circuit on the race's eleventh lap. He was 33 years old. Wheldon was the first driver to die in IndyCar competition since Paul Dana in 2006 and the fifth Indianapolis 500 winner to die in the same year as winning the race. Wheldon was born in the farming village of Emberton near the town of Olney, Buckinghamshire, England on 22 June 1978. He was the son of plumber and domestic heat electrician Clive Wheldon and his wife Sue. Wheldon was of Irish descent and did not have a wealthy background. He had three younger brothers and a sister. Wheldon's family was connected to motorsport; his father had competed in karting from an early age and his mother acted as his timekeeper. He went to the private Bedford School until he completed his GCSE examinations at the age of 16. Wheldon attained good reading grades and excelled in cross-country running, rugby and squash. He was also captain of the school's cricket team. He married his long-time personal assistant Susie Behm of Armstrong, British Columbia, in 2008. They have two children, Sebastian and Oliver. Wheldon was a guest voice over for the TV series Hot Wheels Battle Force 5, and assisted in the physics development for Ignite Game Technologies' online simulation racing game Simraceway. Wheldon began go-kart racing at the age of four but did not take part in competitive racing until he was eight due to age limits. He won the RAC British Cadet Karting Championship three times in 1988, 1989 and 1990. Wheldon went on to win the British B Junior title driving a Wright chassis in 1992. He was later advised by Mark Rose and Terry Fullerton as he progressed to the international level. Wheldon won the 1995 FIA Formula A World Cup with Fullerton's team. Aged 17, he progressed to car racing, competing in the Formula Vauxhall Junior Championship for Team JLR in 1996, winning the Brands Hatch, Silverstone and Oulton Park races for second in the standings. The following year, Wheldon was fourth in both the British Formula Ford Championship and the European Formula Ford Championship for Andy Welch Racing with seven victories. He was named a finalist for the McLaren Autosport BRDC Young Driver of the Year Award in 1996 and 1997. Wheldon improved to third in those two series with the Van Diemen team and drove a Mygale in 1998. That year, he finished second in the Formula Ford Festival at Brands Hatch. It was during this period he developed a rivalry with fellow driver Jenson Button. With Button taking the titles, Wheldon did not have the necessary level of funding from his father to further his career in the United Kingdom and progress into either the British Formula 3 International Series or the British Formula Renault Championship. Thus, at the suggestion of his former team principal and car manufacturer Ralph Firman Sr., he flew to the United States in January 1999 to test a Formula Ford 2000 car. Wheldon also observed an Indy Lights and Toyota Atlantic test session for future preparation. His funding was provided by his team and Van Diemen. He competed in the U.S. F2000 National Championship in 1999 in Jayhard/Primus Racing's Van Diemen RF99, claiming the title on his first attempt with six wins and eleven top-ten finishes. Wheldon's early performance was affected by jet lag from constant travel to the United Kingdom to visit his family. He stopped doing so after about three months, when Van Diemen importer John Baytos urged him to concentrate on racing. Wheldon was named the series' Rookie of the Year for his achievements, and was inducted into its Hall of Fame in 2012 as a 1999 graduate. During the 2000 Toyota Atlantic Championship, he drove for PPI Motorsports in its No. 3 Swift 008.a vehicle, winning the season-opening Homestead–Miami Speedway round to become the first driver in series' history to win on his debut. He won the Mazda Raceway Laguna Seca race, finishing as runner-up in the championship standings with 159 points with a further nine top-ten finishes. Wheldon was named the series' Rookie of the Year for his season's performance. For the 2001 season, Wheldon moved to PacWest Lights to compete in Indy Lights. He won two races (Gateway Motorsports Park and Road Atlanta) and placed in the top-ten in all twelve events to finish as runner-up in the drivers' championship with 149 points. Wheldon was named the 2001 Indy Lights Rookie of the Year for his performance. He was called up later to drive when regular driver Dario Franchitti broke his vertebrae in a motor bike accident in Scotland. In his first race driving the No. 27 Dallara IR-03 Honda HI3R V8 car, at the Indy Japan 300 at Twin Ring Motegi, Wheldon qualified in fifth and finished seventh in the accident-shortened race. He qualified for his first Indianapolis 500 in fifth after his team changed his car number to 26. In late-race, he crashed heavily into a concrete retaining wall and somersaulted into the air before landing upside down, which relegated him to a 19th-place finish. After Franchitti returned, Wheldon was retained as a driver following the retirement of team owner Michael Andretti who mentored him. He drove well thereafter with another eight top-ten finishes. Starting tenth at Chicagoland Speedway, Wheldon led for a season-high 38 laps and came fourth. He ended the season with a third-place finish at Texas Motor Speedway, finishing with 312 points (11th in the point standings). Wheldon's performances enhanced his reputation exponentially, and he demonstrated an accord with oval track racing that many European drivers lacked. He was awarded the 2003 IndyCar Series Rookie of the Year, and was voted the 2003 Autosport Rookie of the Year. Wheldon returned to AGR for the 2004 season. At Phoenix International Raceway (now ISM Raceway), the season's second race, Wheldon won his first career pole position and finished third after his teammate Tony Kanaan passed him on the first lap. He took his first series win at Twin Ring Motegi where he led an event-high 192 laps from pole position. Wheldon qualified second for the Indianapolis 500; he led 26 laps to finish the rain-shortened race in third. His second win of the season came at Richmond International Raceway after holding off Team Penske's Hélio Castroneves in the race's last lap. Wheldon took a quartet of top-ten finishes in four of the next six races, before he won his third series victory in Nazareth Speedway's final motor race to move into second in the drivers' championship. His title challenge to Kanaan ended in the season's penultimate round at California Speedway (now Auto Club Speedway), but he secured second in the standings from Buddy Rice at the season-ending Texas Motor Speedway race with 533 points. For the 2005 season, Wheldon again drove for AGR. He started from eleventh to lead a race-high 158 of 200 laps of the Homestead–Miami Speedway season-opener to win. After that, Wheldon went on to win consecutive races at the Grand Prix of St. Petersburg (his first road course series win), and the Indy Japan 300 for the second year in a row. His season highlight was the Indianapolis 500 where he exchanged the lead with Danica Patrick until she slowed due to a lack of fuel. Wheldon made the race-victory overtake with seven laps to go to become the first British driver to win the event since Graham Hill in 1966. He continued to drive consistently in the top six in the next seven races. At Pikes Peak International Raceway, Wheldon took his fifth win of the season (after leading 67 laps) to equal Sam Hornish Jr.'s 2002 record of five victories during a season. Two races later, at Chicagoland Speedway, he led a race-high 88 laps to better Hornish's series record with his sixth win of the year. Wheldon won the championship before starting the season's penultimate round by running a single practice lap of Watkins Glen International. Since the last place finisher scored 12 points, his 102-point advantage clinched the championship with one race remaining. [a] With a seventh-place finish at the season-closing California Speedway round, Wheldon won the championship with 628 points. He was awarded the 2005 Autosport British Competition Driver of the Year. When Chip Ganassi Racing (CGR) owner Chip Ganassi was informed of rumors that Wheldon might leave AGR, he engaged in informal discussions with him, which led to an agreement in principle at a meeting in August 2005. His AGR contract expired on 31 October and formal discussions began soon after. CGR announced a month later that Wheldon would drive for them. The team changed manufacturers from Panoz to Dallara and engine suppliers to Honda after Toyota withdrew. Wheldon made the switch because he wanted to ensure his stay in the IRL and remain competitive. To begin the 2006 season, Wheldon won the Toyota Indy 300 at Homestead–Miami Speedway. He hit Sam Hornish Jr. in the pit lane during a caution period at the 2006 Grand Prix of St. Petersburg. At the Indianapolis 500, he qualified in third place, and led a race-high 148 laps before falling to fourth because he had to make a pit stop to replace a puncture on the 183rd lap. Wheldon continued to drive consistently with eight top-ten finishes and two pole positions (at Kansas Speedway and Nashville Speedway). Going into the season's final round at Chicagoland Speedway, he was mathematically eligible to win the championship. Wheldon won his second race of the season, but he finished second in the points standings. Although he and Sam Hornish Jr. finished the year with the same number of points, the tie was broken by wins; Hornish had four, and Wheldon two. Wheldon remained with CGR for the 2007 season. He began the season with a pole position at the season-opening XM Satellite Radio Indy 300 at Homestead–Miami Speedway. He led for 177 of 200 laps to win his third successive event at the track, a new series record. Wheldon then led for a race-high 177 laps to claim the victory in the Kansas Lottery Indy 300 at Kansas Speedway, his second of the season. After qualifying sixth for the Indianapolis 500, he retired from the rain-shortened race after a collision with Marco Andretti late in the event, losing his driver's championship advantage. His third-place finish in the ABC Supply Company A.J. Foyt 225 at Milwaukee Mile was overshadowed by a physical confrontation with Danica Patrick after they made contact on the 88th lap; the two reconciled after a private meeting with IndyCar president Brian Barnhart. The rest of Wheldon's season was modest, with four retirements and two further third-place finishes in the SunTrust Indy Challenge and the Detroit Indy Grand Prix. He came fourth in the final points standings with 466 accrued. For the 2008 season, Wheldon stayed with CGR. He began the year with a third-place finish at the season-opening Gainsco Auto Insurance Indy 300 at Homestead–Miami Speedway after moving through the field from a 22nd-place start. Wheldon won the RoadRunner Turbo Indy 300 at Kansas Speedway three races later and became IndyCar's first driver to claim two consecutive victories at the track. He started eighteenth in the Indianapolis 500 finishing six places higher in 12th due to handling problems in the final 50 laps after running as high as second on pit stop strategy. Wheldon took his second (and final) victory of the season in the Iowa Corn Indy 250 at Iowa Speedway. He donated his winnings to help the victims of the recent tornadoes and flooding which had occurred in Iowa. His performance diminished throughout the remainder of the season. He achieved one further podium finish at Nashville Speedway and five top-seven finishes to place fourth in the final drivers' championship standings with 492 points. Wheldon planned to extend his CGR contract when Chip Ganassi provided him with an offer in May 2008, but he decided against doing so when he learnt that AGR's Tony Kanaan had begun discussions with the team. He felt betrayed and began talks with other teams. Wheldon told CGR three months later in Detroit of his decision to leave them at the season's conclusion. He was released from his CGR contract on 3 September as Dario Franchitti left NASCAR and returned to IndyCar. Wheldon returned to Panther Racing for the 2009 season following an agreement with his management and team owner John Barnes in mid-August. He struggled to perform in the first three races, but he took his first top-ten finish with a fifth at the Toyota Grand Prix of Long Beach. At the Indianapolis 500, Wheldon qualified in 18th and finished second. The rest of Wheldon's season was sub-par, with a best finish of fourth at Iowa Speedway and a trio of top-ten placings. He did not attain those results in seven of the year's last eight races. He was tenth in the championship standings with 354 points, his lowest finish since he placed 11th in 2003. Wheldon remained with Panther Racing for the 2010 season. During the season-opening São Paulo Indy 300, he made contact with Alex Tagliani, which sent him into Tony Kanaan, but he recovered to finish fifth. Three races later at the Toyota Grand Prix of Long Beach, Wheldon took a second top-ten result with a ninth. 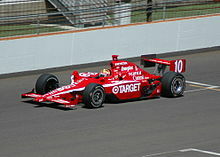 In the Indianapolis 500, Wheldon started from 18th. He advanced through the field on pit stop strategy to come second for the second year in a row. Wheldon remained competitive all year; challenging for wins on oval tracks. Despite strong showings, he could not claim a race victory during his time with Panther Racing, which frustrated John Barnes. In the Indy Grand Prix of Sonoma at Infineon Raceway (now Sonoma Raceway), Wheldon made contact with Bertrand Baguette's car during a warm-up lap before the start of the event. He flipped upside down and pirouetted several times but emerged unhurt. His best finish of the year was a second place in the Peak Antifreeze & Motor Oil Indy 300 at Chicagoland Speedway. He came ninth at the season-ending Cafés do Brasil Indy 300 at Homestead–Miami Speedway, to rank ninth in the drivers' standings with 388 points. After the season, Wheldon left Panther Racing because of a lack of sponsorship and the No. 4 car was driven by rookie J. R. Hildebrand. He filed a $383,400 lawsuit against John Barnes in Marion County Superior Court on 18 August for late payment of his salary and of his share of earnings from his on-track achievements as well as taxation issues. The two reached a settlement on 1 October. Wheldon missed the season's first four races as he sought employment with another team to compete in the Indianapolis 500. He spoke to his friend and former AGR teammate Bryan Herta who offered to assemble a car from his own team, Bryan Herta Autosport, for Wheldon and he agreed. Wheldon drove a 2003-specification Dallara chassis supplied by Sam Schmidt Motorsports and Curb-Agajanian Motorsports. He qualified in sixth place; in the race, Wheldon was in second on the final lap when Hildebrand crashed leaving turn four. He took the lead to become the first driver to win the Indianapolis 500 leading only the final lap. Wheldon made his endurance racing debut at the 2005 24 Hours of Daytona, sharing the No. 2 Howard-Boss Motorsports Pontiac Crawford DP03 with Dario Franchitti, Marino Franchitti and Milka Duno. Their car finished 16th in its class and 33rd overall after Duno crashed with less than six hours to go. In the 2005 off-season, he competed as a wild card entrant in the 2005 Race of Champions, being eliminated from the Round of 16 by Sébastien Bourdais in a buggy car. That year, he was offered a test driver role with BMW's Formula One operation by team principal Mario Theissen. He declined when he discovered that he would not be assured a race seat for the 2007 season; he also felt emotionally attached to the United States. Wheldon also turned down an offer to compete for Great Britain in the inaugural A1 Grand Prix season. In 2006, Wheldon returned to compete in the season-opening 24 Hours of Daytona for Chip Ganassi Racing with Scott Dixon and Casey Mears in the Daytona Prototype class. The trio won its class and overall, completing 734 laps in the No. 02 Riley MkXI Lexus. He returned with the same team for the following year's race, again partnered by Dixon, and they were joined by Memo Rojas in the No. 2 entry. The trio retired after 538 laps because Rojas crashed on the saturated track in the race's 21st hour. They were classified 21st in class and 41st overall. Wheldon returned for a fourth time to participate in the 24 Hours of Daytona for Chip Ganassi Racing with Dixon, Alex Lloyd and Salvador Durán. Their car, starting in tenth in its category and overall, finished 44th overall (18th in its class) after it retired with 515 laps completed due to it sustaining three accidents during the event. IndyCar Series CEO Randy Bernard set up a challenge for the season-ending 2011 IZOD IndyCar World Championship at Las Vegas Motor Speedway on 16 October. $5 million would be divided equally between the driver and a randomly selected fan if the driver won from the back of the grid. He was unable to get an international racing driver so he offered the challenge to Wheldon who accepted. Wheldon was also ABC's in-race reporter and spoke in defense of his participation in the event and IndyCar to the network's commentary team during the warm-up laps. On lap 11, a fifteen-car accident occurred between turns one and two in which Wheldon was involved. He was in 24th and travelling on the inside line at 224 mph (360 km/h) in an attempt to avoid the pile-up and flying debris. Driver Vitor Meira then spun towards the infield and collected fellow competitors E. J. Viso and Charlie Kimball. They blocked Wheldon's path, and he decelerated to 10% of throttle usage before he hit the left-rear tyre of Kimball's car at 165 mph (266 km/h). He was launched semi-airborne for approximately 325 ft (99 m) and rotated towards the right-hand side catchfence. Wheldon's vehicle rotated and travelled parallel to the catchfence above the concrete wall behind the SAFER barrier alongside the track. He collided with a fence post along his tub's right-hand side, creating a deep defect in the tub that extended from the pedal bulkhead along its upper section and through the cockpit. That deformed its roll hoop and sheared from the tub. The post penetrated the cockpit and struck the lower portion of the right-hand side of Wheldon's helmet in an impact measured at -30Gs lateral, 47Gs longitudinal, and -25Gs vertical to the chassis as he sustained "two distinct impacts" to his head. The race was stopped after one caution lap. He was extricated from his car by the trackside safety team and their Las Vegas-based colleagues and was airlifted to the University Medical Center of Southern Nevada for his critical injuries. Wheldon was pronounced dead on arrival. He was 33 years old. After input from drivers and team owners, officials declared they would abandon the race. A five-lap, three-wide formation salute was held in Wheldon's honour, along with his No. 77 displayed alone at the top of the scoring pylon. An autopsy conducted by Clark County Coroner Michael Murphy on 17 October determined that Wheldon died of a blunt force trauma to his head. He was the fifth Indianapolis 500 winner to die in a racing accident in the same year as winning the race, and the first repeat winner to do so. Preceding Wheldon were Gaston Chevrolet (1920), Joe Boyer (1924), Ray Keech (1929), and George Robson (1946). He was also the first driver to be killed in IndyCar competition since Paul Dana died in an accident during practice for the 2006 Toyota Indy 300 at Homestead–Miami Speedway. On 22 October, Wheldon was given a funeral at the First Presbyterian Church of St. Petersburg in front of a crowd of almost 1,000 mourners. Fellow drivers Dario Franchitti, Scott Dixon and Tony Kanaan acted as pall-bearers with Wheldon's three brothers. The next day, IndyCar held a public memorial service for him at Conseco Fieldhouse (now Bankers Life Fieldhouse) in Indianapolis attended by members of the motor racing community and his family and fans. A second memorial service for Wheldon took place at the All Saints' Church in his home town of Emberton on 6 November. He is buried at the Calvary Catholic Cemetery in Clearwater, Florida. Three days after the accident, series' organisers with assistance from the Automobile Competition Committee for the United States, the United States' national governing body of motor racing, and motorsport's world governing body, the Fédération Internationale de l'Automobile, announced that the race would be subject to a full investigation. The results of the investigation into Wheldon's death were released on 15 December 2011. According to the report, there was no single cause for Wheldon's crash. Contributing factors included the catch fencing around the circuit, and the unlimited movement on the track surface under racing conditions that created more car-to-car contact making it difficult to predict what would occur around the drivers. "Whilst several factors coincided to produce a perfect storm, none of them can be singled out as the sole cause of the accident. For this reason it is impossible to determine with certainty that the result would have been any different if one or more of the factors did not exist." Marcus Simmons, a writer for the British motor racing magazine Autosport, called Wheldon "one of a golden crop of richly-talented British drivers to graduate from karting to junior single-seaters in the mid to late-1990s", and, "a man who embodied the ideal of the immigrant to the 'New World' fulfilling the American Dream." Although he had a brash and confident persona that made him "cocky yet likeable", journalist Maurice Hamilton noted that Wheldon was seen by many as "a devoted family man, deeply respected and universally liked despite, or perhaps because of, a cheeky sense of self-awareness and a clever cultivation of his image". He had charisma, a sense of humour and warmth that made him a favourite amongst motor racing fans and the media, despite being unrecognisable in England due to Formula One being the country's most popular motor racing series. Two days after his death, Dallara named their new one-specification chassis in Wheldon's honour. The DW12, with the new bumper/nerf bar section being featured, was designed to prevent many similar single-seater crashes such as the one that killed him. A charity race in Wheldon's honour was held in Milton Keynes on 6 December with drivers such as Dario Franchitti, Jenson Button and Anthony Davidson competing. Proceeds from the event were donated to a charity selected by Wheldon's family. That month, Wheldon was posthumously awarded the Gregor Grant Award for his lifetime career achievements that his father Clive and Franchitti collected. Former racing driver Mark Dismore's New Castle Motorsports Park, which organises the Robo-Pong 200 endurance karting event that Wheldon won in 2005, named the trophy the Dan Wheldon Cup in 2012. The Wheldon family added a Wheldon Memorial Pro-Am to the event in 2013. On 7 March 2012, Wheldon's widow Susie and mayor Bill Foster unveiled a street sign in St. Petersburg, Florida. Named "Dan Wheldon Way", the sign was placed at the corner of Bayshore Drive and Albert Whitted Park (turn ten). A permanent memorial is also located across from the Salvador Dalí Museum. Dario Franchitti won the 2012 Indianapolis 500 on 27 May and dedicated his victory to Wheldon and wore white sunglasses in his honour. That year Wheldon was memorialised by a resolution passed by the Indiana Senate. A memorial plaque featuring his likeness and career achievements was unveiled in St. Petersburg outside the second turn of its street track in March 2013 and a wall in which each of the winners of the race was etched. Four months later, Autosport magazine named Wheldon one of the 50 greatest drivers to have never raced in Formula One. The Wheldons were honoured with the "Dan and Susie Wheldon Make a Difference Award" in September 2014. This included a $1,000 donation to charity and became part of the annual IndyCar Series prize-giving banquet. During the 2016 Kobalt 400 at Las Vegas Motor Speedway, pit reporter Jamie Little, and motorsport publicist Brent Brush placed a Dan Wheldon Memorial plaque outside turn two, near the point where he was killed. In May, a book entitled Lionheart: Remembering Dan Wheldon covering his life and career with contributions from the motor racing community was published. On 20 March 2019, it was announced that Wheldon will be formally inducted into the Indianapolis Motor Speedway Hall of Fame on 23 May. The Dan Wheldon International Driver Trophy was awarded to the best performing international driver over the race weekend of the Australian V8 Supercars Gold Coast 600. The trophy was named after Wheldon following his death, which took place a week prior to the 2011 event in which he was scheduled to participate with the Holden Racing Team. [c] The international drivers' trophy had been unnamed when it debuted in 2010. The trophy was discontinued after 2012 as a change in regulations stated that international co-drivers were no longer compulsory in the race. 3 Race abandoned after 15-car crash on lap 11 involving Wheldon, who would later succumb to injuries sustained in the accident. ** Podium (non-win) indicates second or third place finishes. *** Top 10s (non-podium) indicates fourth through tenth place finishes. ^ Wheldon became the first British driver to win an American open-wheel championship since Nigel Mansell in 1993, and the first to win both the Indianapolis 500 and the title since Jacques Villeneuve in 1995. ^ After Wheldon's death, his car was driven by the 2011 Rookie of the Year James Hinchcliffe. ^ FIA GT1 World Championship driver Darren Turner took over Wheldon's place for the 2011 Armor All Gold Coast 600. ^ Maume, Chris (18 October 2011). "Dan Wheldon: One of the few British racing drivers to win the Indy 500". The Independent. Archived from the original on 21 October 2011. Retrieved 16 December 2018. ^ a b Dwyre, Bill (16 October 2011). "Dan Wheldon was an engaging young champion". Los Angeles Times. Archived from the original on 19 October 2011. Retrieved 17 December 2018. ^ a b Marriage, Ollie (17 October 2011). "Dan Wheldon: 1978-2011". Top Gear. Archived from the original on 26 September 2015. Retrieved 17 December 2018. ^ a b c d e f Owen, Oliver (28 May 2006). "Dan the fast man". The Observer. Archived from the original on 22 September 2014. Retrieved 16 December 2018. ^ "Dan Wheldon killed in IndyCar crash". Bedford Today. 16 October 2011. Archived from the original on 16 December 2018. Retrieved 16 December 2018. ^ Jones, Terry (21 July 2009). "Lacombe connection at Indy". Canoe.com. Archived from the original on 11 June 2015. Retrieved 16 December 2018. ^ a b Curry, Coleen (17 October 2011). "Dan Wheldon Started Racing Go-Karts When He Was 4". ABC News. Associated Press. Archived from the original on 18 October 2011. Retrieved 16 December 2018. ^ Lewandowski, Dave (9 February 2011). "Wheldon, super hero of Battle Force 5". IndyCar Series. Archived from the original on 19 October 2011. Retrieved 17 October 2011. ^ Lewin, Andrew (12 August 2011). "Wheldon to help develop new online racing sim". Crash. Archived from the original on 16 November 2018. Retrieved 20 December 2018. ^ a b c d M. Walker, Teresa (26 July 2003). "When Andretti talks, Wheldon listens". The Cincinnati Post. Associated Press. Archived from the original on 3 August 2003. Retrieved 17 December 2018. ^ "Dan Wheldon, 1978-2011". Commission Internationale de Karting. 17 October 2011. Archived from the original on 20 October 2011. Retrieved 16 December 2018. ^ a b c d e f g h i Simmons, Marcus (17 October 2011). "Dan Wheldon: 1978 - 2011". Autosport. Archived from the original on 16 December 2018. Retrieved 16 December 2018. ^ a b c d "Dan Wheldon". Driver Database. Retrieved 16 December 2018. ^ a b c Arritt, Dan (25 August 2000). "He's on a Roll but Needs a New Ride". Los Angeles Times. p. D10. Archived from the original on 25 October 2015. Retrieved 16 December 2018. ^ a b c d e Widdows, Rob (October 2011). "Stateside Story". Motor Sport. 87 (10): 63–67. Archived from the original on 21 December 2018. Retrieved 16 December 2018. ^ Viner, Brian (25 May 2007). "Dan Wheldon: 'Winning at Monaco would be great, but it's nothing next to the Indy 500'". The Independent. Archived from the original on 25 May 2008. Retrieved 16 December 2018. ^ a b c d Wagstaff, Ian (2010). The British at Indianapolis. Poundbury, Dorchester, England: Veloce Publishing. pp. 169–178. ISBN 978-1-84584-246-8. Retrieved 19 December 2018. ^ "NA-F2000: 1999 Season Review". motorsport.com. 10 November 1999. Archived from the original on 16 December 2018. Retrieved 16 December 2018. ^ a b c d "Former U.S. F2000 champ Wheldon to join Hornish at Panther for remainder of IRL season". Autoweek. 9 June 2002. Archived from the original on 19 June 2016. Retrieved 18 June 2016. ^ "Hall of Fame". U.S. F2000 National Championship. Archived from the original on 17 April 2014. Retrieved 21 December 2018. ^ "New drivers join PPIM Atlantic squad". Autosport. 17 January 2000. Archived from the original on 16 December 2018. Retrieved 16 December 2018. ^ a b c "Dan Wheldon – Atlantic Stats". Champ Car Stats. Archived from the original on 17 September 2016. Retrieved 16 December 2018. ^ "Dan Wheldon Career Highlights". DanWheldon.com. Archived from the original on 28 January 2007. Retrieved 16 December 2018. ^ "Wheldon Tapped to Take Over Dixon's Invesys/PacWest Ride in 2001". Dayton Indy Lights. 14 December 2000. Archived from the original on 6 July 2002. Retrieved 16 December 2018. ^ a b "Dan Wheldon – 2001 Firestone / Dayton Indy Lights Results". Racing-Reference. Archived from the original on 23 December 2018. Retrieved 16 December 2018. ^ a b "Dan Wheldon – 2002 Indy Racing League Results". Racing-Reference. Archived from the original on 23 December 2018. Retrieved 17 December 2018. ^ "Wheldon confirmed at Andretti Green". Autosport. 27 November 2002. Archived from the original on 17 December 2018. Retrieved 17 December 2018. ^ Hilderbrand, Brian (9 April 2003). "Motorcycle accident sidelines Dario Franchitti". Las Vegas Sun. Archived from the original on 17 December 2018. Retrieved 17 December 2018. 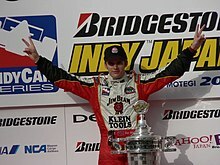 ^ a b c d "Dan Wheldon – 2003 IndyCar Series Results". Racing-Reference. Archived from the original on 23 December 2018. Retrieved 17 December 2018. ^ Wilson, Phillip B. (26 May 2003). "Wheldon brushes off horrific looking accident". The Indianapolis Star. p. R02. ^ a b c Rehagen, Tony (May 2005). "Meet Dan Wheldon". Indianapolis Monthly: 128–131 & 268–273. ISSN 0899-0328. Archived from the original on 17 December 2018 – via Google Books. ^ "Fan vote delivers Wheldon another rookie award". Crash. 9 December 2003. Archived from the original on 22 December 2003. Retrieved 17 December 2018. ^ "Wheldon re-signs with Andretti". Autosport. 31 October 2003. Archived from the original on 17 December 2018. Retrieved 17 December 2018. ^ "Roundup: Kanaan repeats as Phoenix champion". Pittsburgh Tribune-Review. Associated Press. 22 March 2004. Archived from the original on 17 December 2018. Retrieved 17 December 2018. ^ "Wheldon wins Indy Japan 300". United Press International. 17 April 2004. Archived from the original on 17 December 2018. Retrieved 17 December 2018. ^ Allsop, Derick (1 June 2004). "Wheldon slips up as Rice negotiates rain". The Independent. Archived from the original on 17 December 2018. Retrieved 17 December 2018. ^ Schaller, Jake (27 June 2004). "Trust Goes Long Way for Wheldon". The Washington Post. Archived from the original on 17 December 2018. Retrieved 17 December 2018. ^ a b "Dan Wheldon – 2004 IndyCar Series Results". Racing-Reference. Archived from the original on 23 December 2018. Retrieved 17 December 2018. ^ "Wheldon heads clean sweep". BBC Sport. 30 August 2004. Archived from the original on 14 February 2013. Retrieved 17 December 2018. ^ Cavin, Curt (17 October 2004). "First in a Long Time: Helio Castroneves wins the IRL's Texas race... and it costs him $50,000". Autoweek. Archived from the original on 17 December 2018. Retrieved 17 December 2018. ^ Cain, Holly (4 April 2005). "Wheldon Wheels To Win". The St. Petersburg Times. Archived from the original on 14 April 2005. Retrieved 17 December 2018. ^ "Wheldon Wins at Motegi". Autosport. 30 April 2005. Archived from the original on 17 December 2018. Retrieved 17 December 2018. ^ "Wheldon wins Indy 500". Eurosport. 30 May 2005. Archived from the original on 17 December 2018. Retrieved 17 December 2018. ^ a b c "Dan Wheldon – 2005 IndyCar Series Results". Racing-Reference. Archived from the original on 23 December 2018. Retrieved 17 December 2018. ^ Chambers, Mike (21 August 2005). "IRL's utility man". Denver Post. Archived from the original on 17 December 2018. Retrieved 17 December 2018. ^ "Wheldon Virtually Clinches IRL Title". Los Angeles Times. 12 September 2005. Archived from the original on 17 December 2018. Retrieved 17 December 2018. ^ a b Hart, Simon (25 September 2005). "Wheldon takes lap of honour". The Sunday Telegraph. p. 015. Retrieved 17 December 2018 – via PressReader. ^ a b Redmayne, Tim (4 December 2005). "British Comp. Driver: Dan Wheldon". Autosport. Archived from the original on 21 December 2018. Retrieved 21 December 2018. ^ "Will Wheldon Leave Andretti Green?". Autoweek. 55 (45): 52–53. 11 November 2005. ISSN 0192-9674 – via EBSCO's Academic Search. ^ Miller, Robin (28 November 2005). "Ganassi Confirms Wheldon, Honda, Dallara". Speed. Archived from the original on 1 December 2005. Retrieved 18 December 2018. ^ "Wheldon: leaving AGR not easy". Autosport. 29 November 2005. Archived from the original on 18 December 2018. Retrieved 18 December 2018. ^ Biebrich, Richard (27 March 2006). "A Driver's Duel". Sun-Sentinel. Archived from the original on 18 December 2018. Retrieved 18 December 2018. ^ O'Leary, Jamie (22 May 2006). "Wheldon third on grid for Indy 500". The Daily Telegraph. Archived from the original on 7 July 2016. Retrieved 18 December 2018. ^ Smith, Paul (30 May 2006). "Motorcyling: (sic) Wheldon is left feeling flat". The Independent. Archived from the original on 18 December 2018. Retrieved 18 December 2018. ^ a b "Dan Wheldon – 2006 IndyCar Series Results". Racing-Reference. Archived from the original on 23 December 2018. Retrieved 18 December 2018. ^ Haddock, Tim (9 September 2006). "Indy racing season to wrap up Sunday". Los Angeles Daily News. Archived from the original on 18 December 2018. Retrieved 18 December 2018. ^ a b "Dan's race, Sam's title". Eurosport. 10 September 2006. Archived from the original on 18 December 2018. Retrieved 18 December 2018. ^ Cavin, Curt (25 March 2007). "Indy Car Rewind; Dan Wheldon emerges on top during a familiar IRL weekend". Autoweek. Archived from the original on 18 December 2018. Retrieved 18 December 2018. ^ Oreovicz, John (30 April 2007). "Wheldon gives Target Chip Ganassi pre-Indy boost". ESPN. Archived from the original on 18 December 2018. Retrieved 18 December 2018. ^ Durrett, Richard (7 June 2007). "TMS gets high mileage from Dan-Danica feud". The Dallas Morning News. Retrieved 1 January 2018 – via PressReader. ^ "Patrick, Wheldon make up; Sharp takes pole". Lubbock Avalanche-Journal. June 9, 2007. Archived from the original on January 6, 2018. Retrieved January 1, 2018. ^ a b "Dan Wheldon – 2007 IndyCar Series Results". Racing-Reference. Archived from the original on 23 December 2018. Retrieved 18 December 2018. ^ Navarro, Manny (30 March 2008). "INDYCAR: Wheldon fails to defend title". Miami Herald. p. D16. ^ Elmquist, Jason (28 April 2008). "Wheldon wins at Kansas Speedway". The Shawnee Dispatch. Archived from the original on 19 December 2018. Retrieved 19 December 2018. ^ "Wheldon wins Iowa". The Province. 23 June 2008. p. A36. Retrieved 19 December 2018 – via PressReader. ^ a b "Dan Wheldon – 2008 IndyCar Series Results". Racing-Reference. Archived from the original on 23 December 2018. Retrieved 19 December 2018. ^ James, Brant (3 September 2008). "Wheldon takes a risk as he returns home to Panther". Sports Illustrated. Archived from the original on 19 December 2018. Retrieved 19 December 2018. ^ Schwarb, John (13 May 2009). "Slow going for Wheldon, Panther Racing". ESPN. Archived from the original on 19 December 2018. Retrieved 19 December 2018. ^ Philip, Sam (26 May 2009). "Indy 500 news - Brits miss out on Indy crown - 2009". Top Gear. Archived from the original on 19 December 2018. Retrieved 19 December 2018. ^ a b c "Dan Wheldon – 2009 IndyCar Series Results". Racing-Reference. Archived from the original on 23 December 2018. Retrieved 19 December 2018. ^ "Tagliani says Wheldon hit seemed deliberate". Sportsnet. The Canadian Press. 16 March 2010. Archived from the original on 20 December 2018. Retrieved 20 December 2018. ^ a b c "Dan Wheldon – 2010 IZOD IndyCar Series Results". Racing-Reference. Archived from the original on 23 December 2018. Retrieved 20 December 2018. ^ Strang, Simon (31 May 2010). "Q & A with Dan Wheldon". Autosport. Archived from the original on 3 June 2010. Retrieved 20 December 2018. ^ FitzGerald, Tom (23 August 2010). "Dan Wheldon flips heading for start at Infineon". San Francisco Chronicle. Archived from the original on 20 December 2018. Retrieved 20 December 2018. ^ Potter, Bill (29 August 2010). "IndyCar Series Delivers Again at Chicagoland". SB Nation. Archived from the original on 20 December 2018. Retrieved 20 December 2018. ^ Beeler, Tom (1 October 2010). "Update: Wheldon Files Suit Against Panther Racing – Reached Settlement". Racing Information Service. 2010 (10). Archived from the original on 20 December 2018. ^ a b c Cole Smith, Steven (30 May 2011). "Why Dan Wheldon won't give up". Autoweek. Archived from the original on 20 December 2018. Retrieved 20 December 2018. ^ a b c Anderson, Lars (24 October 2011). 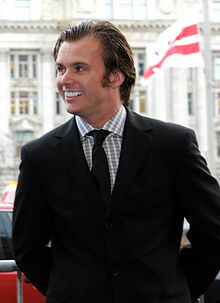 "Dan Wheldon 1978–2011". Sports Illustrated. Archived from the original on 30 April 2017. Retrieved 20 December 2018. ^ "Wheldon To Drive No. 77 At Kentucky". Speed Sport. 26 September 2011. Archived from the original on 20 December 2018. Retrieved 20 December 2018. ^ Tremayne, Sam (3 October 2011). "Carpenter scores maiden IndyCar win as Franchitti reclaims championship lead". Autosport. Archived from the original on 7 October 2011. Retrieved 20 December 2018. ^ Scianitti, Matthew (12 January 2012). "James Hinchcliffe takes over Danica Patrick's car". National Post. Archived from the original on 22 December 2018. Retrieved 22 December 2018. ^ a b Weeks, Jim (15 July 2015). "Throwback Thursday: The Death of Dan Wheldon". Vice. Archived from the original on 16 December 2018. Retrieved 16 December 2018. ^ "Daytona 24: Citgo Racing No. 2 race report". motorsport.com. 7 February 2005. Archived from the original on 18 December 2018. Retrieved 18 December 2018. ^ "Race of Champions: Schaulaufen der Stars". Auto motor und sport (in German). 4 December 2005. Archived from the original on 18 December 2018. Retrieved 18 December 2018. ^ Cavin, Curt (11 December 2005). "A Rally-Good Show: Sebastien Loeb takes the annual Race of Champions". Autoweek. Archived from the original on 18 December 2018. Retrieved 18 December 2018. ^ Salisbury, Matt (30 January 2006). "Grand-Am: Ganassi secure maiden Rolex 24 win". Crash. Archived from the original on 18 December 2018. Retrieved 18 December 2018. ^ J. Staat, Willem (29 January 2007). "Sportscars: Overwinning voor Montoya/Pruett/Duran op Daytona" (in Dutch). Autosport.nl. Archived from the original on 19 December 2018. Retrieved 19 December 2018. ^ "Rolex 24 at Daytona final results". ESPN. Associated Press. Archived from the original on 19 December 2018. Retrieved 19 December 2018. ^ "2008 Rolex 24 at Daytona". Racing-Reference. Archived from the original on 23 December 2018. Retrieved 19 December 2018. ^ Harris, Mike (27 January 2008). "Autos: Ganassi wins third Rolex 24-Hour in a row". Honolulu Star-Advertiser. Archived from the original on 1 February 2008. Retrieved 19 December 2018. ^ Ueberbacher, Karl (13 October 2011). "Wheldon Aiming To Become IndyCar's First Five Million Dollar Man". HuffPost. Archived from the original on 18 October 2012. Retrieved 20 December 2018. ^ a b Fryer, Jenna (15 December 2011). "IndyCar: Dan Wheldon killed from head hitting post". Bangor Daily News. Associated Press. Archived from the original on 20 December 2018. Retrieved 20 December 2018. ^ a b c d Collins, Sam (16 December 2011). ""The Perfect Storm"". Racecar Engineering. Archived from the original on 8 January 2012. Retrieved 20 December 2018. ^ a b c d Blount, Terry (16 October 2011). "Dan Wheldon dies after IndyCar crash". ESPN. Archived from the original on 8 July 2017. Retrieved 20 December 2018. ^ Strang, Simon (18 October 2011). "Doctors confirm head trauma caused Dan Wheldon's death". Autosport. Archived from the original on 20 October 2011. Retrieved 21 December 2018. ^ Hawley, Larry (18 October 2011). "Wheldon's death leaves Indy 500 void for 2012". WXIN. Archived from the original on 4 April 2012. Retrieved 20 November 2011. ^ Green, Robert (22 October 2011). "British racer Wheldon mourned at Florida funeral". Reuters. Archived from the original on 20 December 2018. Retrieved 20 December 2018. ^ "Memorial service celebrates life of racer Dan Wheldon". CNN. 24 October 2011. Archived from the original on 24 October 2011. Retrieved 20 December 2018. ^ "Service for Indy champion Wheldon". BBC News. 6 November 2011. Archived from the original on 8 November 2011. Retrieved 20 December 2018. ^ Wilson, Scott (17 August 2016). Resting Places: The Burial Sites of More Than 14,000 Famous Persons (3rd ed.). Jefferson, North Carolina: McFarland & Company. p. 802. ISBN 978-0-7864-7992-4. Retrieved 6 March 2019. ^ Strang, Simon (19 October 2011). "FIA to assist IndyCar Series in its investigation into Dan Wheldon's death". Autosport. Archived from the original on 20 October 2011. Retrieved 19 October 2011. ^ "Dan Wheldon 'was killed by a fence post' at Las Vegas Motor Speedway track, IndyCar officials determine". The Daily Telegraph. 15 December 2011. Archived from the original on 16 December 2011. Retrieved 21 December 2018. ^ Hayes, Reggie (25 May 2006). "Indy 500 another way for Wheldon to validate career". News & Record. Retrieved 21 December 2018. ^ Hamilton, Maurice (25 May 2016). "Remembering Dan Wheldon". ESPN UK. Archived from the original on 28 May 2016. Retrieved 21 December 2018. ^ O'Leary, Jamie (18 October 2011). "Dallara to name 2012 IndyCar in honour of Dan Wheldon". Autosport. Archived from the original on 20 October 2011. Retrieved 21 December 2018. ^ "Stars race to honour Dan Wheldon in Milton Keynes". BBC News. 5 December 2011. Archived from the original on 6 December 2011. Retrieved 5 December 2011. ^ Tremayne, Sam (4 December 2011). "Autosport Awards Gregor Grant Award: Dan Wheldon". Autosport. Archived from the original on 6 December 2011. Retrieved 21 December 2018. ^ "IndyCar Stars Highlight Dan Wheldon Pro-Am Karting Challenge". Indianapolis Motor Speedway. 11 September 2014. Archived from the original on 21 December 2018. Retrieved 21 December 2018. ^ Tomlin, Jim (8 March 2012). 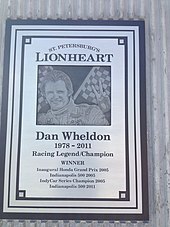 "St. Petersburg pays tribute to Dan Wheldon by renaming street after him". Tampa Bay Times. Archived from the original on 13 March 2012. Retrieved 8 March 2012. ^ "Dario Franchitti wins 2012 Indy 500". Fox Sports. 27 May 2012. Archived from the original on 8 March 2016. Retrieved 21 December 2018. ^ "Passed Senate Resoultion 002". Indiana Senate. 2012. Archived from the original on 21 December 2018. Retrieved 21 December 2018. ^ Ryan, Nate (21 March 2013). "Dan Wheldon memorialized before IndyCar season opener". USA Today. Archived from the original on 22 March 2013. Retrieved 21 December 2018. ^ "Power receives the trappings of IndyCar title". Speedcafe. 1 September 2014. Archived from the original on 3 September 2014. Retrieved 21 December 2018. ^ Jensen, Tom (5 March 2016). "FOX NASCAR reporter Jamie Little pays tribute to the late Dan Wheldon". Fox Sports. Archived from the original on 8 April 2016. Retrieved 21 December 2018. ^ Masefield, Fraser (24 May 2016). "Dan Wheldon remembered before landmark 100th Indianapolis 500". Eurosport. Archived from the original on 26 December 2018. Retrieved 26 December 2018. ^ Malsher, David (20 March 2019). "Wheldon elected to Indianapolis Motor Speedway Hall of Fame". motorsport.com. Retrieved 21 March 2019. ^ "Englishman Darren Turner to replace Dan Wheldon". Radio New Zealand. 19 October 2011. Archived from the original on 13 February 2018. Retrieved 23 December 2018. ^ "Gold Coast 600 trophy named in Wheldon's memory". The Sydney Morning Herald. 22 October 2011. Archived from the original on 21 December 2018. Retrieved 21 December 2018. ^ a b "Whincup holds off Van Giz for mega win". Speedcafe. 24 October 2010. Archived from the original on 25 September 2014. Retrieved 21 December 2018. ^ Phelps, James (19 February 2013). "V8 revolution has enduring quality". The Daily Telegraph. Archived from the original on 21 December 2018. Retrieved 21 December 2018. ^ Lomas, Gordon (22 October 2011). "V8 Supercars: Bourdais claims Wheldon trophy at Surfers Paradise race". Autoweek. Archived from the original on 21 December 2018. Retrieved 21 December 2018. ^ Woods, Chelsea (22 October 2012). "FPR end Triple Eight's winning streak". TouringCarTimes. Archived from the original on 21 December 2018. Retrieved 21 December 2018. ^ "Dan Wheldon – 2011 IZOD IndyCar Series Results". Racing-Reference. Archived from the original on 23 December 2018. Retrieved 21 December 2018. ^ a b c d "Dan Wheldon – IndyCar Series Statistics". Champ Car Stats. Archived from the original on 28 September 2012. Retrieved 21 December 2018. ^ a b c d e "Complete Archive of Dan Wheldon". Racing Sports Cars. Archived from the original on 21 December 2018. Retrieved 21 December 2018. Wikimedia Commons has media related to Dan Wheldon.